What's going on with the fifth war — The War in the Heavens (Revelation 12)? Dr. Reagan: That is indeed when the war against the Jews and the Saints occurs. By "saints" I mean those who have accepted Jesus during the Tribulation. There is going to be a great harvest of souls during the Tribulation. Some people will turn to Jesus Christ as a result of the Rapture. They will have been told that it is going to occur. I think the Rapture itself is an event that will cause many to turn to the Lord. And then, there are also going to be Bibles everywhere. I have marked up my Bible really well so that a person won't have to search diligently, but they can find the key Scriptures. There will be Scripture everywhere. There is going to be all kinds of information on the internet before the Antichrist can close it down. We're posting videos right now for people who are left behind, and others are doing the same thing. We are told right at the end of the Tribulation what I call the "Gospel Angel" will be unleashed by God. He will circumnavigate the globe and preach the Gospel to every person on planet Earth before the final pouring out of God's wrath. So, there are going to be a great number of people saved during the Tribulation, though most are going to be killed by the Antichrist, some will live to the end. Satan hates the Jews because they are the chosen people of God, because they gave the Scriptures to the world, and because it was through them the Messiah was sent. Because God has promised He is going to save a great remnant, Satan doesn't want God to keep that promise, and so he will go after every Jew and every Gentile believer on planet Earth during that last 3 1/2 years. 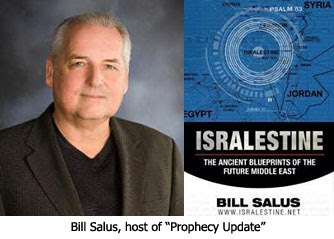 Bill Salus: We know that the Antichrist will want a war against the Saints because of the spread of the Gospel, but why war against the Jews? Well, I think you said it when you brought forward their important role in God's plan. Ultimately, if Satan can utterly destroy the Jews, he can prove God to be a promise breaker and justify his leaving his post of proper habitation. Dr. Reagan: Revelation 12:14 says that Israel will flee on the "wings of a great eagle," which is a terminology taken out of the Old Testament when they fled out of Egypt. They came out on the wings of a great eagle, which is symbolic language for the fact that they came out under the protection of Almighty God. It says, too, that the army that is sent after them by the Antichrist will be swallowed up, probably supernaturally by God. In Daniel we are told that the Antichrist will not be allowed to go into that area which we today call Jordan, and so he will be kept out of the area.